What About Brazil Coffee Regions? 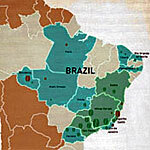 Three are the famous best Brazil coffee regions of production. However, a fourth area should not be taken lightly. Check out which they are! If you want to learn how to buy Brazilian coffee, you may want to read on. A fourth area, that most of the time is unfairly taken lightly, is one in the very center of São Paulo state, around the City of Garça (gah-sah) in the Central-Western region of the state. With modest sunshine and showers, Brazil Coffee Regions present stable weather and are great for both Arabica and Robusta (Northern Cerrado only) coffee types growth. Around 70% of the production is the noble, Arabica, and the rest accounts for Robusta, stronger, but with a lower quality. This area is named after the old “Mogiana Railway Company” that is still settled, while not active, along the border between Minas and São Paulo. In a time when the railroad was crucial for the coffee business, the area brought great development and wealth to São Paulo. The soil there is red and very rich helping agriculture in its support to the vibrant local economy. The Southern area of the State of Minas Gerais is responsible for, maybe, the best quality coffee in Brazil and, most certainly one of the best – if not the best, when treated properly – in the world. 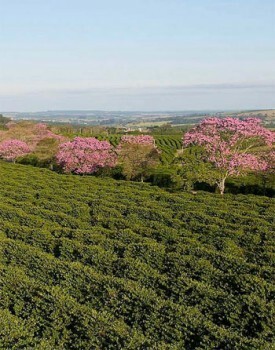 With semi-arid conditions, these central Brazilian plateaus, spread along 3 states, between Minas and Brasilia, deliver, mostly, the lower quality Robusta type. There is also an area called Minas Cerrado in which great Arabica Coffee is produced. This region with a semi-arid soil, good heights, and great weather produces a great bold type of coffee. I’m quite suspicious, to say the least since this is where I live and this coffee is the one I prefer. Sorry, but it is the best! The best coffee among those produced in Brazil (besides central west SP!) is the Brazilian Santos Bourbon, a worldwide well known Gourmet Coffee. The port of Santos is a traditional market area where many coffee trade companies still act. Also, the port is where the largest volume of coffee is exported from. A low body coffee, Brazilian Santos Bourbon is not acid, has a very pleasing scent, and a polished flavor. Some of the sweet taste of the fruit transports to the powder and can be noticed when drank pure black. That is due to the drying process done naturally, without any artificial techniques. Please leave a comment about Brazil Coffee Regions. Very informative post! I have always wanted to visit the coffee producing regions in Brazil. It is quite intriguing, a science I am sure, how the different types of soil and altitude contribute to the quality and taste of the coffee. Is it true that coffee grown at higher altitudes also contains higher amounts of caffeine? Thank you for your kind remarks. From a former Brazilian coffee farmer’s point of view, I have never heard anything relating caffeine and altitude. I will ask the science experts in town and, if there is a relation, I’ll post an article about it. I’m actually enjoying a nice cup of coffee while I read your article about coffee. What could be better! I’ve heard of the Sul Minas region but I’ve never heard of the other two. Sul Minas has such a great reputation for producing amazing coffee. I’ve never purchased any coffee from that region (at least not that I’m aware of) so I will definitely check it out. Thanks for sharing your impressions. I have relatives and friends that produce coffee in all 4 major quality coffee regions of Brazil and I can guarantee, with very low chances of being mistaken, that all of them can be considered the best, depending only on taste. haha. It is very personal indeed. One fact remains, though. I find them all excellent when brewed correctly. 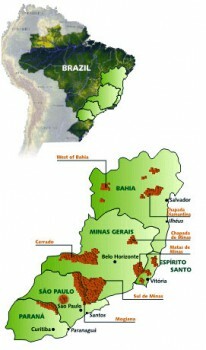 Very interesting post on Brazilian coffee regions. I absolutely love Brazilian coffee but I think Colombian is my favourite thus far, Costa Rican coffee is also excellent. I didn’t realize that Brazilian coffee varies so much depending on the region, nor did I know that the country had a variety of coffee regions. Is the flavour of the coffee in each region quite different? Thanks sharing your impressions. Yes, the taste of Brazilian coffee can vary from region to region. I never knew that Brazil had so many coffee plantation areas. It is just impressive. I just started drinking more coffee. In the beginning, I didn’t like it at all but with time I learned to enjoy every cup of warm coffee. I will definitely try Brazilian coffee in the near future. As someone who has never really been into coffee this article amazes me. Who knew their were so many coffee types out there! (Probably everyone besides me lol) My grandma would really find this interesting though, she’s a huge coffee fan! I will definitely have to venture to these places someday with her and try the coffee! Thanks for sharing your impressions. I hope that you and your grandmother have fun browsing around our Brazilian mojo website. Coffee isn’t just coffee anymore. There are definitely coffee aficionados just as there are for wine and food. And here we are talking about Brazilian coffee. Mogiana, in Brazil, has rich soil which produces a rich, fruity, mellow coffee that is balanced in sweetness and acidity. Sul Minas could be considered the best coffee in Brazil, if not in the world. It has a coffee that is full-bodied and fruity with just a hint of acidity. Cerrado is semi-arid region which produces a great Arabica bean, which is nice and earthy, highly acidic and bitter. Western Sao Paulo has coffee that is fruity, mellow and sweet. The sweet taste can still be tasted once the coffee is made which can be prized by those who prefer that. So if you are looking for a Brazilian coffee, look for one that goes with the flavor you are looking for. Thanks so much for sharing your opinion and informative input. Cheers!